This is definitely one of those meals that cooks itself, so you can Netflix binge, do laundry, or whatever while it’s doing it’s thing, and then just come back at the end to plate it up and enjoy. Perfect for a busy (or lazy) Saturday, or even for cooking while you’re away at the office during the week. 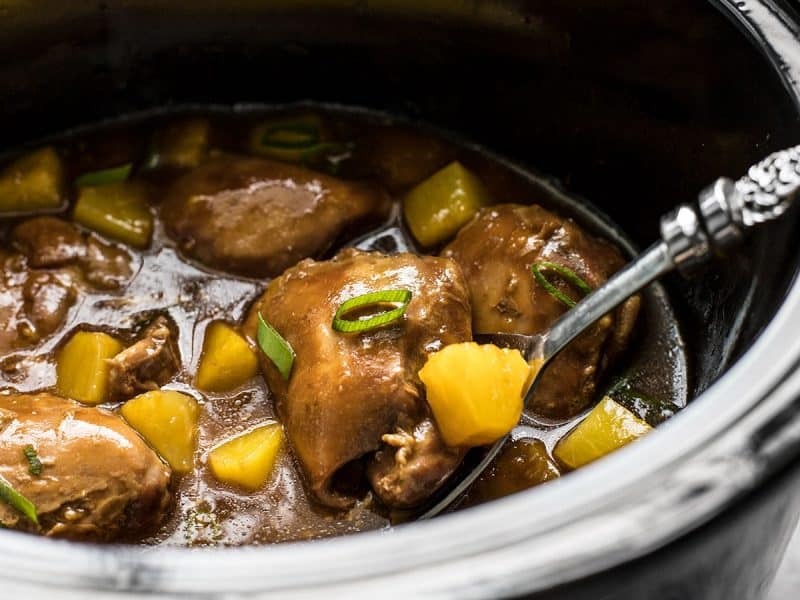 And yes, you can make this Slow Cooker Pineapple Teriyaki Chicken with breasts instead, but I will warn you that they will turn out a little more dry and not nearly as succulent as these dark meat thighs. Unfortunately that’s just the way it works. 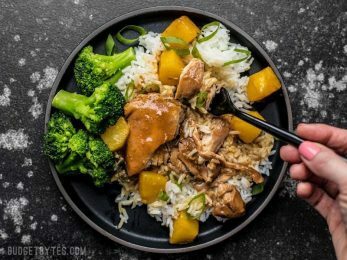 There is plenty of pineapple teriyaki sauce in the pot at the end of cooking, so spoon the meat, sauce, and pineapple over some hot rice, or a big ol’ pile of vegetables. …or both! I just reached into my freezer for a few broccoli florets to add some green to the meal, but you could always stir fry up a vegetable mix and then add the chicken and sauce on top of that instead of rice. YUM! 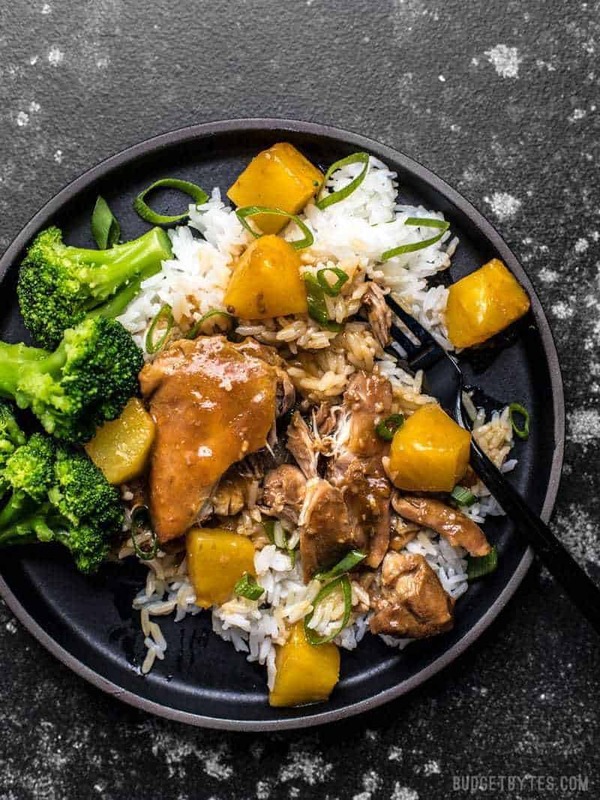 With just a few ingredients, dinner doesn’t get easier (or tastier) than this Slow Cooker Pineapple Teriyaki Chicken. Skip the take out tonight! Separate the juice from the pineapple chunks. You should have approximately 3/4 cup juice. The juice will go into the sauce and the pineapple chunks will be added later. Refrigerate the pineapple chunks until they’re needed. To make the pineapple teriyaki sauce, stir together the pineapple juice, soy sauce, brown sugar, minced garlic, and grated ginger. If you have a little less than 3/4 cup pineapple juice, you can add a bit of water to bring it up to 3/4 cup. 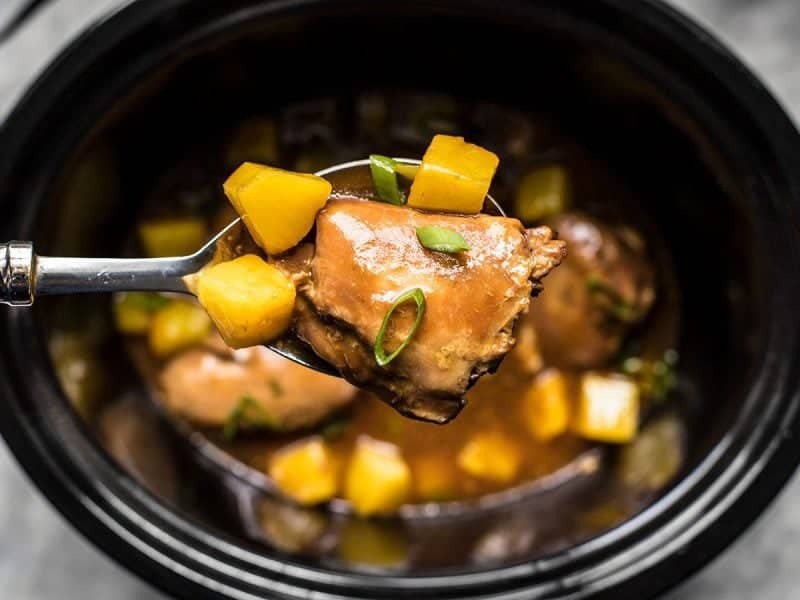 Place the chicken thighs in the slow cooker and pour the pineapple teriyaki sauce over top. 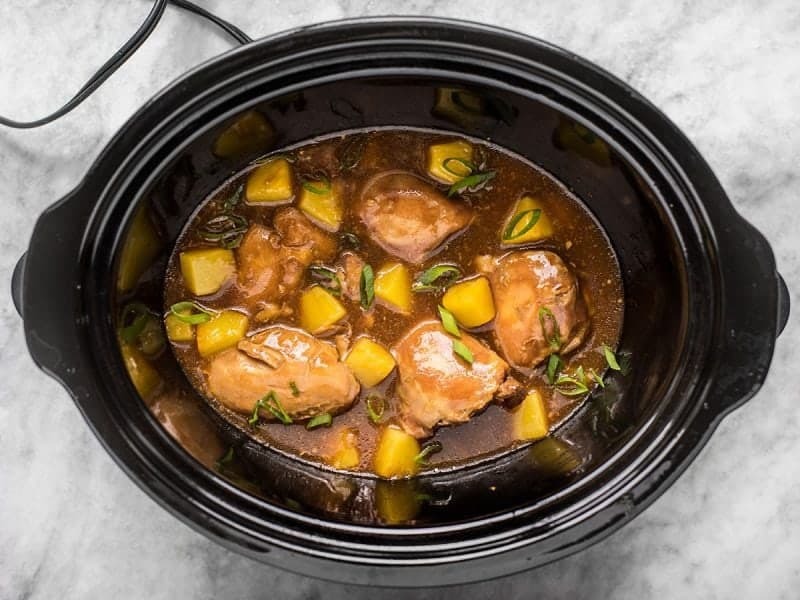 Close the slow cooker and cook on high for four hours or low for eight hours. Flip the chicken 3/4 of the way through cooking to make sure all the meat is exposed to the marinade. After cooking, carefully lift the chicken out of the slow cooker (it will be fall-apart tender). 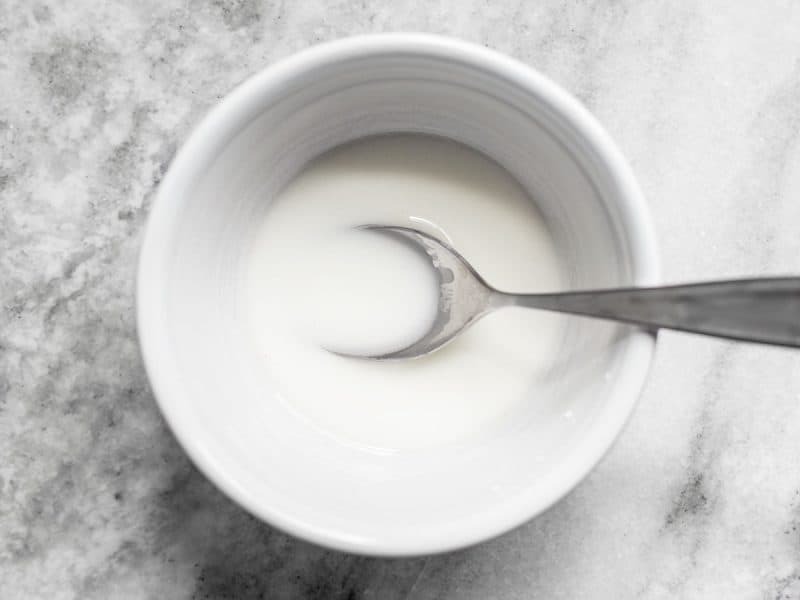 In a small bowl, stir together the cornstarch with 2 Tbsp water, then whisk it into the remaining liquid in the slow cooker. Replace the lid and let it simmer for 5 minutes on high, or until thickened. Once the sauce is thickened, add the pineapple chunks and stir to combine. Finally, add the cooked chicken back to the pot and coat with sauce. Sprinkle sliced green onions over top, and serve over a bed of rice. *You can use bone in or boneless chicken thighs for this recipe. The chicken will be extremely tender after cooking, so you can either leave the pieces whole, or shred it into the sauce (remove the bones if using bone-in chicken). I left my chicken pieces whole for easy portioning. Begin by draining one 20 oz. can of pineapple chunks in juice. You’ll be using both the juice and the pineapple chunks, but they’ll be added to the recipe at different points. You should get approximately 3/4 cup juice out of the can. If you’re slightly under, you can add a bit of water to bring it up to 3/4 cup. Refrigerate the pineapple chunks until it’s time to add them to the recipe. 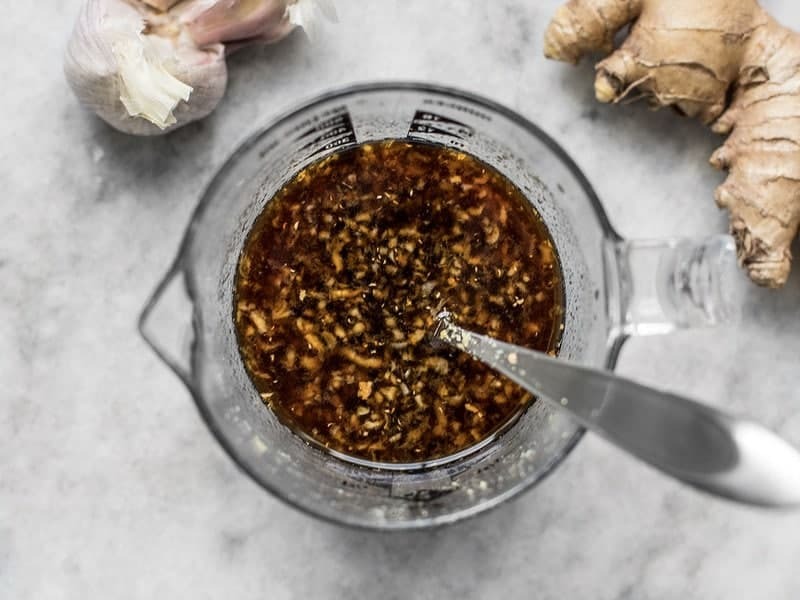 To make the pineapple teriyaki sauce, combine the 3/4 cup pineapple juice with 1/4 cup soy sauce, 2 Tbsp brown sugar, 2 cloves garlic (minced), and about 1 tsp grated fresh ginger. 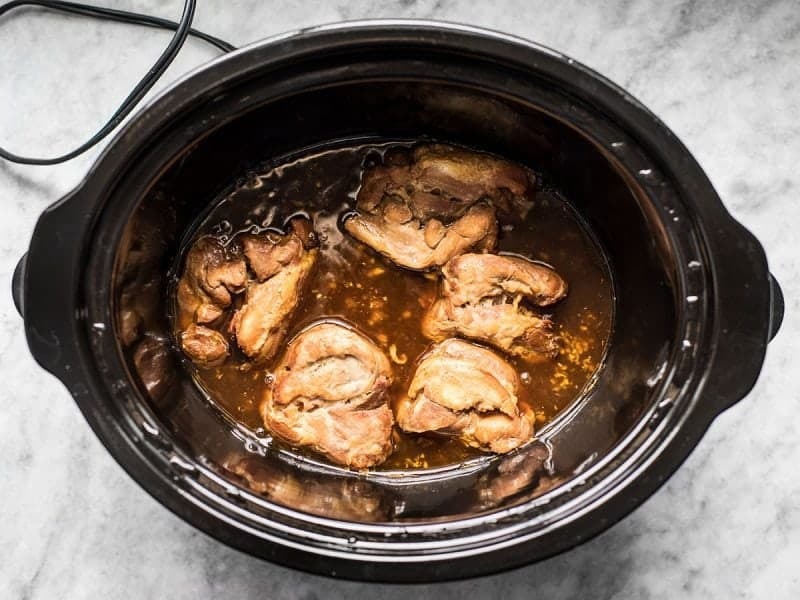 Place five skinless chicken thighs in the slow cooker (bone-in or boneless) and pour the marinade over top. 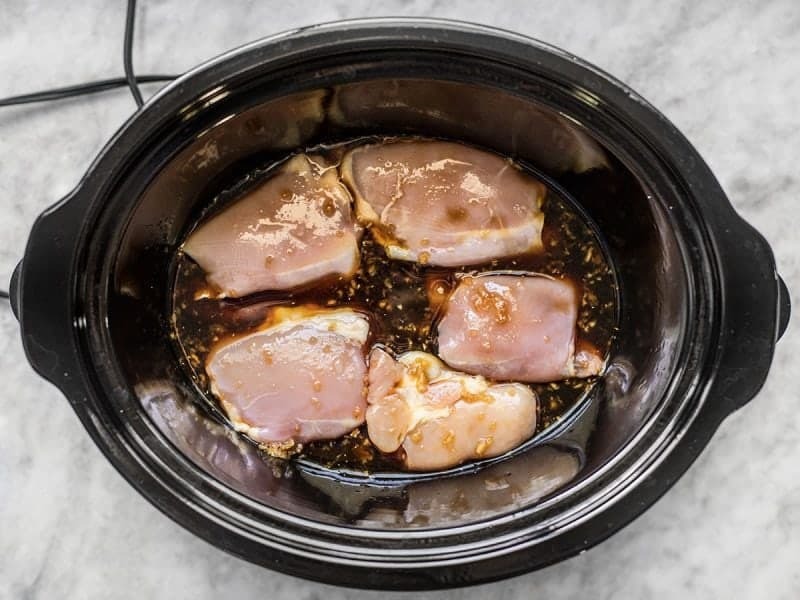 Place the lid on the slow cooker and cook on high for four hours or low for eight hours. Turn the chicken once about 3/4 of the way through, just to make sure all the meat is in contact with the sauce. After cooking, carefully lift the chicken out of the pot and place it on a plate or cutting board. In a small dish, stir together 1.5 Tbsp cornstarch and 2 Tbsp water. Whisk this into the remaining liquid in the slow cooker. Replace the lid and let it simmer on high for about 5 minutes, or until it has thickened. 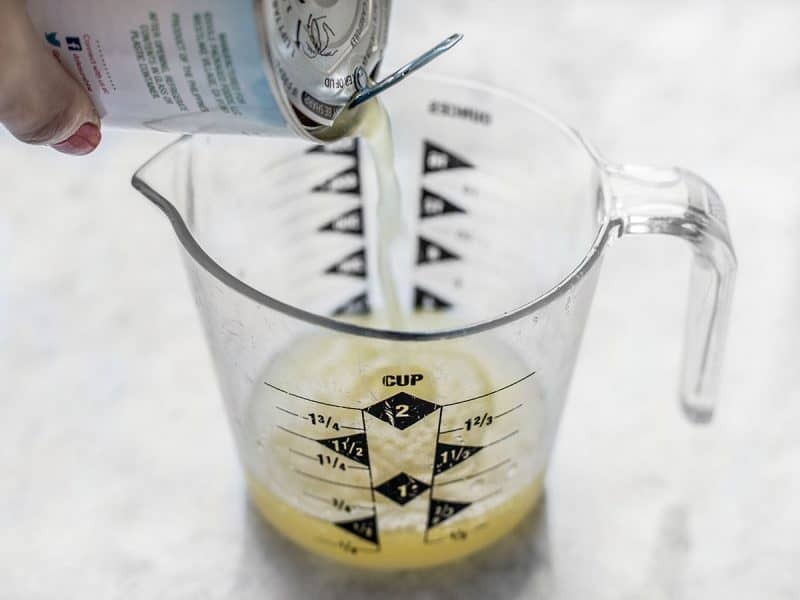 Cornstarch only thickens liquids once it reaches a simmer, so make sure it’s simmering. Once the sauce has thickened, add the pineapple chunks to the pot and stir to combine. And finally, add the cooked chicken back to the pot and coat it in the sauce. Sprinkle sliced green onions over top and serve! 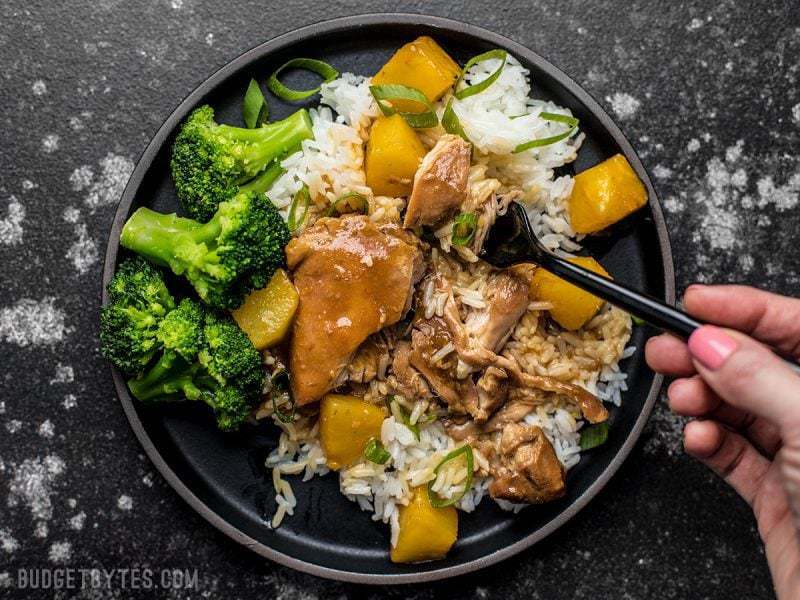 Slow Cooker Pineapple Teriyaki Chicken – The official meal of “pajamas and Netflix” days! 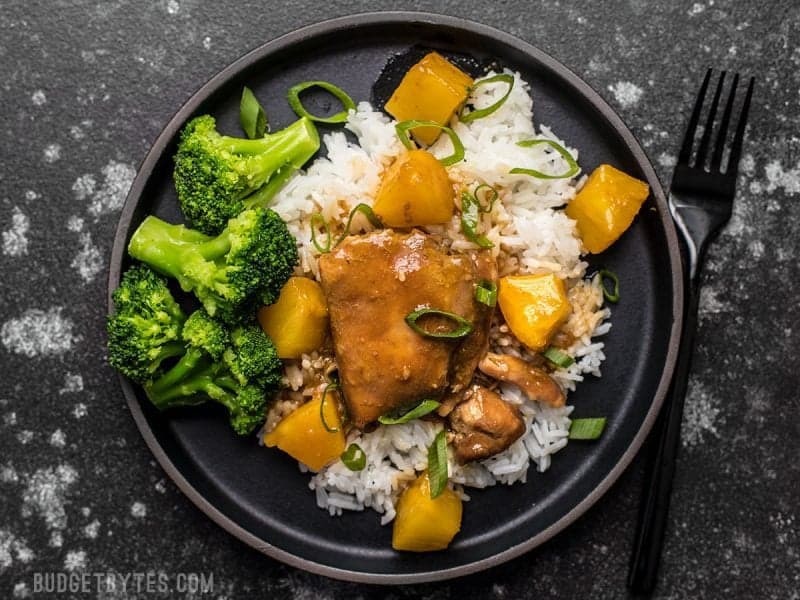 The post Slow Cooker Pineapple Teriyaki Chicken appeared first on Budget Bytes.